Published Nov 2, 2016 By Julia 2 CommentsThis post may contain affiliate links. 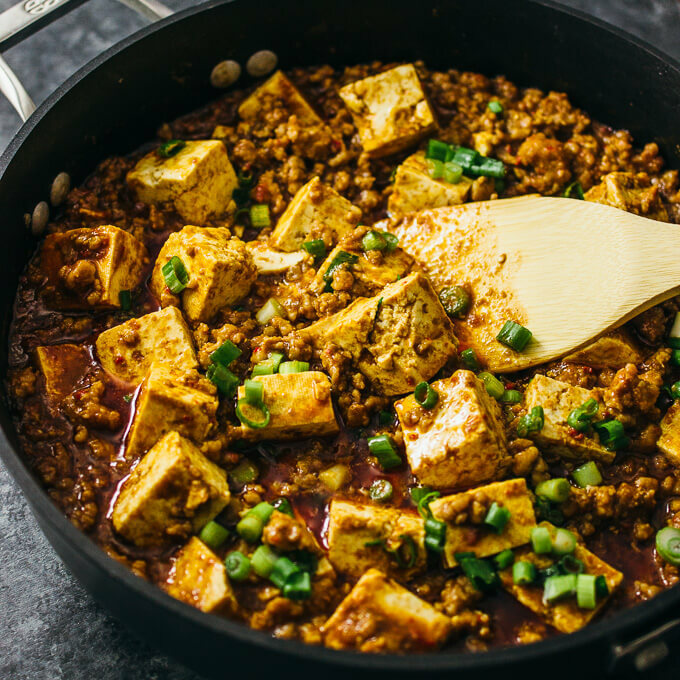 Mapo tofu (or mapo doufu) is a popular Chinese stir-fry dish composed of tofu chunks, ground pork, and a spicy sauce. The sauce is the highlight of the dish, with strong flavors of chili, bean paste, and garlic. 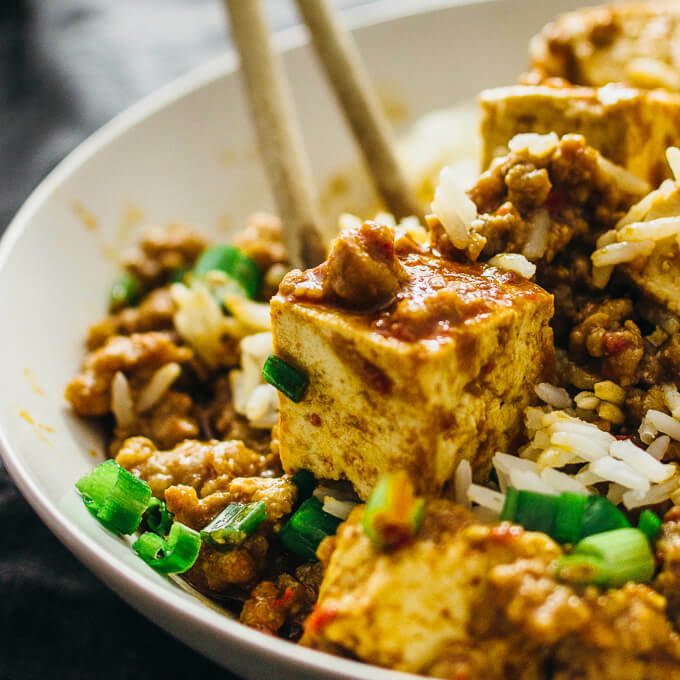 My family has been making mapo tofu for generations, and I remember eating this dish often in my childhood. It has a very distinct mapo tofu flavor, which to me means the combination of hot chilis, minced garlic, and bean paste. I haven’t tasted any other sauce quite like it, and it’s one of those sauces that is instantly recognizable to my tastebuds. 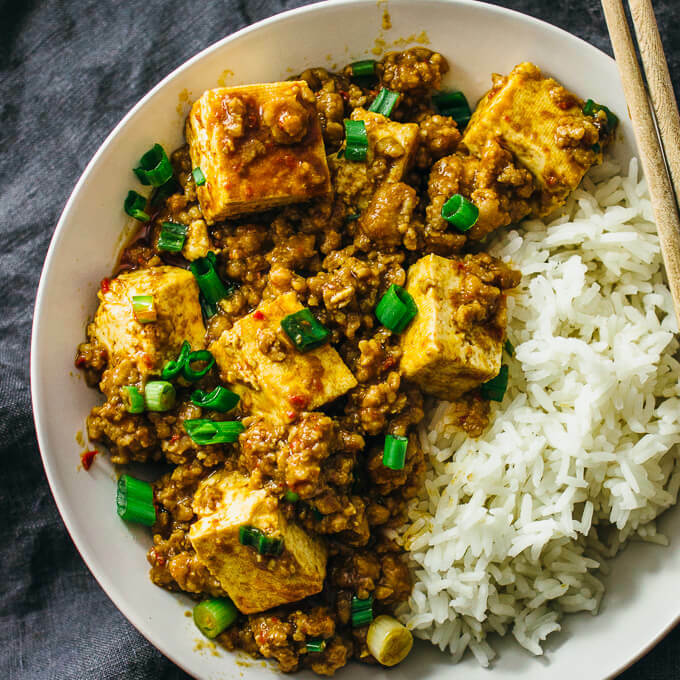 One of my cousins absolutely loves mapo tofu and she makes this dish every week, if not a few times each week. 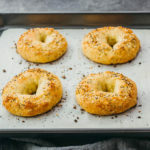 She gave me her recipe last year, and it’s one of those recipes that have ingredients where everything is “to taste” and rarely have any quantities attached to them. 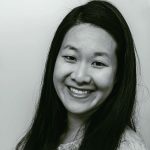 To ensure that I was making this dish as authentically as possible, I also consulted a friend of mine who grew up in China. 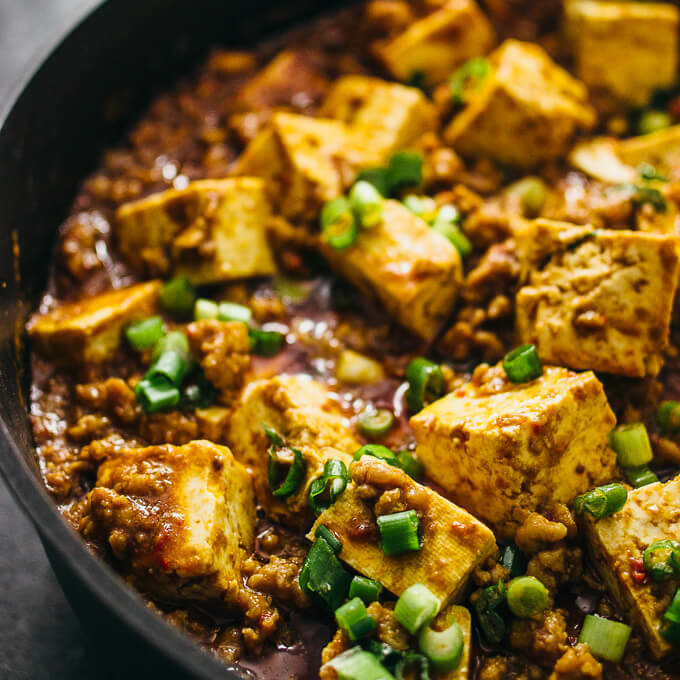 This is a one-pan recipe where there’s only about 15 minutes of actual cooking time: first, the ground pork is browned, then the tofu, and lastly these ingredients are mixed with the sauce. 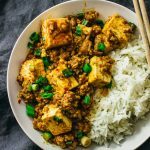 It’s a really fast dish, great for weeknight dinners, and way better than ordering Chinese takeout. It’s traditionally served over white rice, but you can also serve as-is for a low carb meal. I prefer the pork extra tender, so I toss it with corn starch before browning it on the pan. As for the sauce, you can make it as I describe in the recipe below, or you can take a shortcut and use a mix of bean paste and store-bought chili garlic sauce to the same effect. These ingredients can be bought online on Amazon, in any Asian food store, or at Whole Foods’ Asian aisle. For a lighter tofu meal, check out my easy weeknight tofu stir fry recipe. 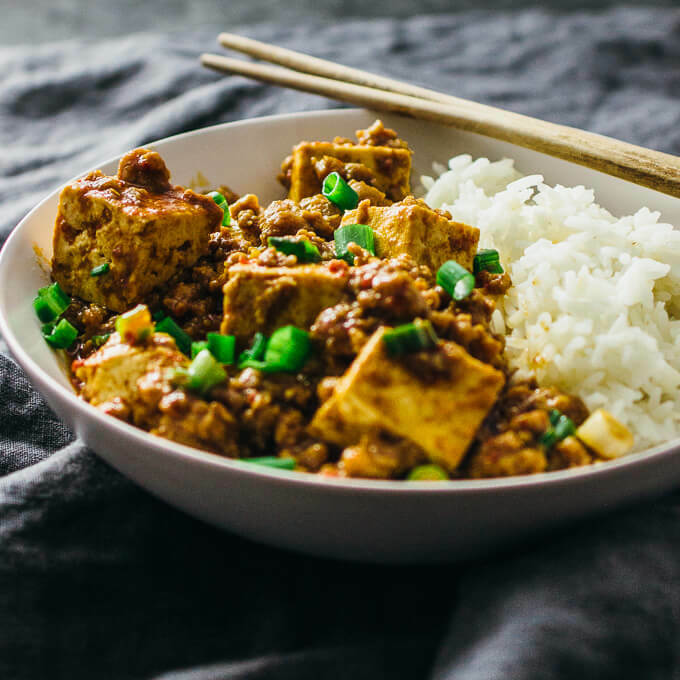 Mapo tofu (or mapo doufu) is a popular Chinese stir-fry dish composed of tofu chunks, ground pork, and a spicy sauce. Break up the ground pork in a bowl and toss with corn starch. Set aside. Combine all of the chili-garlic-bean sauce ingredients in a blender. Blend until smooth. Set aside. Heat canola oil on a large pan over medium heat. Add ground pork to the pan and cook until it’s mostly browned, about 5-10 minutes, breaking it apart as it cooks. Add tofu cubes to the same pan and mix with the ground pork. Cook for about 5 minutes, stirring occasionally. Add the sauce to the same pan, and mix well. Bring to a simmer. Remove the pan from heat. Stir in scallions. 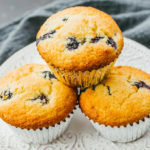 This recipe yields 13 g net carbs per serving. Nutrition information does not include rice. Yumm! I love mapo tofu. Yours looks so delicious Julia! I really want this right now! 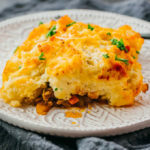 It looks like comfort food to me and I’ve been on a tofu trend lately.